Do you know that it is possible to freely move categories, sub-categories, as well as all related data back and forth between two Magento 2 websites without any headaches and essential time expenditures? 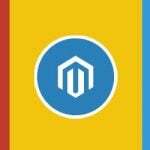 You only need the Commerce Extensions Bulk Categories Import / Export Magento 2 module to be installed. Being a part of the company’s Migration bundle, this extension covers several important areas described below. Or you can use more robust, fully-featured, however more expensive extension as an alternative. In this article we will talk about all the options available for moving categories and managing product stock. Of course, you can do everything manually, but it is not the best idea especially if there are lots of categories on your Magento 2 store. The first reason why we don’t recommend you to do everything without the Bulk Categories Import / Export extension is huge time expenditures related to manual category copying. The second one is a human factor and the possibility of mistakes. If you also think that these two reasons are enough to use the extension, check what it exactly does. 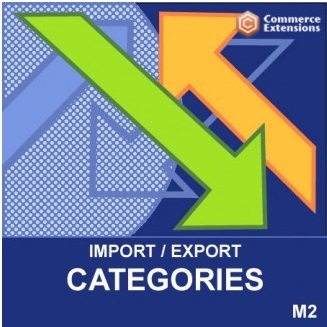 As mentioned above, Commerce Extensions Bulk Categories Import / Export for Magento 2 knows how to import and export all your categories with appropriate sub-categories and related data. Meta data, category descriptions, and category images can be easily moved from one website to another within just a few clicks. It is wonderful because you save tons of time and effort. Various Settings – custom layout and design settings are transferred as well. Note that images and thumbnails can be imported/exported by URL or from a server locally. And it is even possible to transfer product positions as well as product SKUs related to each category. There are also a few tips on how to use the Commerce Extensions Bulk Categories Import / Export Magento 2 module. First of all, it is recommended to use Openoffice.org to edit CSV files. Save them in UTF-8 format. Using Excel will strip the format braking import as a result. It is also necessary to mention that there are two ways of image import: either by setting “import_images_by_url” to “Yes” – “HTTP://www.example.com/image.jpg” should be supplied in the “category_image” column, or by setting the same parameter to “No” – “imagename.jpg” must be supplied in the same column. For fields and value settings, check the official extension’s page and the manual on it. 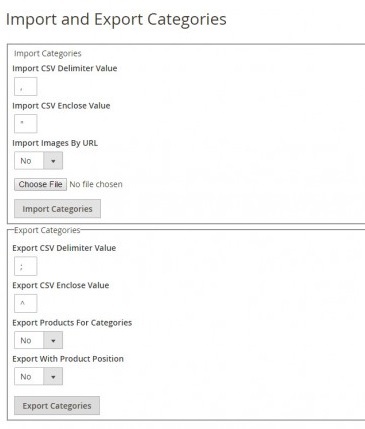 The Improved Import and Export extension for Magento 2 can do the same Bulk Categories Import / Export does. 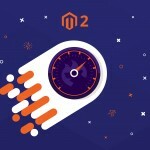 However, it does it better, in a simple, convenient way, and it comes with additional features allowing to import and export EVERY Magento 2 entity: products, orders, you name it; including MSI and B2B entities. To start with, the extension offers import and export jobs. The jobs are like the Magento 2 rules, they dictate which entity, in which file format should be exported or imported on which conditions. The jobs can be scheduled to run automatically and save you a bit of time. The jobs can be accessed from the System > Improved Import/Export section. 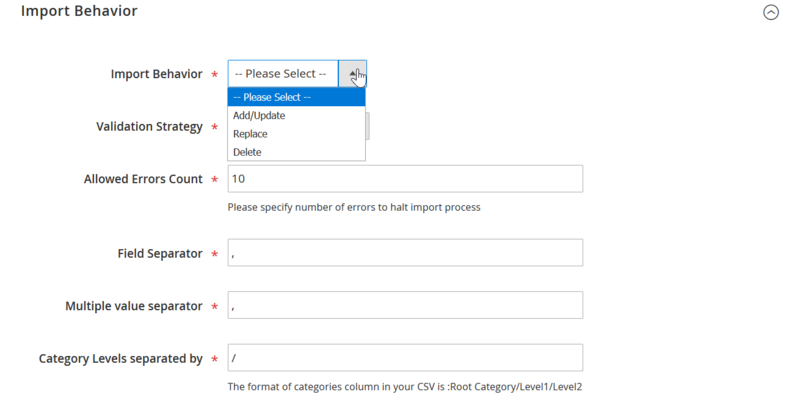 Let’s create a new category import job to see how it works. As we progress through importing categories, you may want to follow the process at the Improved Import and Export demo store to have a visual example. At the import jobs grid you can see all the jobs you have created. Here, by clicking ‘Add New Job’ button you can create a new job. Let’s do this and import a some categories. The first section of the new import job will be General Settings. Here you name the job and decide if you want to run it on a schedule. This is pretty simple if you are familiar with cron-scheduler. If not, you can find all required information on how to use it in the Improved Import and Export manual. Scroll down for the next job settings section. In the Import Settings section you select the entity you want to import. You can see all the available entities at the screenshot above. Select ‘Categories’ and proceed for the next configuration section. In the Import Behavior section you decide HOW you want to import the categories. 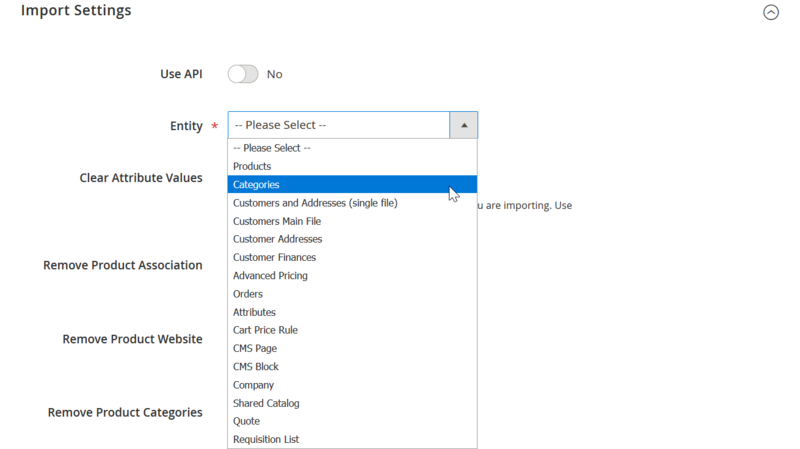 Whether you want to add new categories, replace existing categories with the same name, or remove categories that are listed in the imported table from your store. Moreover, if you are using CSV file, you can map separators used to create table. When done with the behavior and separators scroll down for the next settings section. In the Import Source section you can select the file type you are importing. 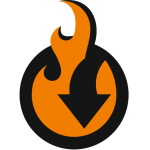 The extension supports CSV, XML, Json, XLSX, and ODS file types. For this blog post purposes let’s use the Google Sheets table. To import from the Google Sheet – just copy the link to the sheet and paste it in the import job. Make sure to share the table prior to importing though, so the extension would have read permissions. As for the sample file, Firebear team composed Google Sheet Master table. 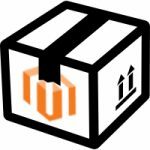 In this Google Sheet you can find sample files with all Magento 2 entities available for import and export. Additionally, every attribute comes with explanation and instructions which values are accepted. When the import table is uploaded hit ‘Validate file’ button to let the extension check the file for integrity. Then scroll below for attribute mapping. Every entity you import consists of attributes. Magento 2 only allows for particular attribute naming. However, if you are importing data from your CRM or ERP system, you may actually have different column names. For such cases you can use Map Attributes section – to map Magento 2 default attributes with custom names in your file. The process is pretty straightforward and can help you save lots of time editing files, or changing the whole naming system in your CRM or ERP software. That’s it. Once you are done with attribute mapping hit big orange ‘Save & Run’ button to start the import process. Improved Import and Export extension will take care of everything else. What’s the trick? Both extensions can be used to move categories around, however Bulk Categories Import / Export is rather a one trick pony, while Improved Import and Export extension will help you manage your store efficiently even after you are done with categories. Yes, the extensions come with radically different prices, however, considering functionality offered and benefits you get such as: reduced management time, automatic catalog and customer updates, integrations with CRM and ERP software; Improved Import and Export extension comes a winner in the long run. The Commerce Extensions Bulk Categories Import / Export Magento 2 module is one of the biggest time-savers related to category import/export. If you want to move the appropriate data from one store to another – pay attention to the extension. It costs just 50 bucks. As for the Improved Import & Export Magento 2 Extension, it not only allows transferring categories. You can also map external categories to the ones used internally when importing product data. Furthermore, new categories can be created on the fly right during the import process. Import and export data via various online sheets, such as Google Sheets.